What’s That Long Line of Motorcycles? A Charity Ride for Cancer Navigators. About 80 bikers gathered at the American Legion in Rockmart, Georgia yesterday, to raise money for Cancer Navigators of Rome, a great organization that helps, at no cost, cancer patients and their families steer through the nightmare of treatment, resources, adjustment and survival. I went by myself. A friend had to cancel at the last minute. But I didn’t mind. Bikers are a friendly lot. We salute each other while riding, stop and check on others sitting on our bikes on the side of the road, and chew the fat wherever we stop – gas stations, fast food places, sketchy looking bars. I remember one memorable conversation with another biker while waiting in line for the mermaid show at Weeki Wachee Springs in Florida. Admiration of mermaids can bring together folks from all walks of life. Motorcycling has been used as a metaphor for life. You’re on a long journey and you load up on supplies for the trip, usually more than you really need. You might plan your route out, but you inevitably get lost, often ending up somewhere you had never dreamed of. Of course, you need to stop and refuel along the way and you have layovers in certain towns with haunting names, like Last Chance, Colorado. You often pick up and drop off passengers for the trip. Some might ride with you for the whole journey; others you might have to leave at a crossroad so they can catch the next stage west. We are all sovereign wayfarers with our own highways to traverse. After the salute to the lost POW’s, a rendition of the national anthem and a blessing of the bikes it was KSU – kick stands up. With the local police leading and backing up the pack (Ha, I thought. If the cops were looking for me they’d never find me here! ), I just mellowed out and enjoyed the view. Eventually, we got out into the country and down some twisty roads, past pine trees, maples, willows, pecan trees, cedars, blooming honeysuckle, and Chinese privit with its cloying scent. In staggered formation we flew among modern brick homes, doublewides with built on decks, shotgun cottages and rickety barns with rusting tin roofs. There were cows grazing and brown horses romping in fields of brilliant buttercups. The trees cast long secret shadows across the roads and innocent children waved from porches. After returning to the hall it was time for chicken dinners, a raffle, an auction and some music. A lot of money by some good-hearted people was raised for Cancer Navigators that day. Whatever our mode of transportation we are all sojourners on the short time we have on this earth and some lives are briefer than others, because of the devastation of cancer and other diseases. Diseases that are hard on both riders, and their passengers who eventually must disembark, usually too soon. We all need some kindness and support on our journeys and it’s great that there are fellow riders and organizations like Cancer Navigators out there to provide it. And even if you don’t ride, I can assure you that there’s someone out there who needs your compassion, or maybe, just maybe, you might need theirs. 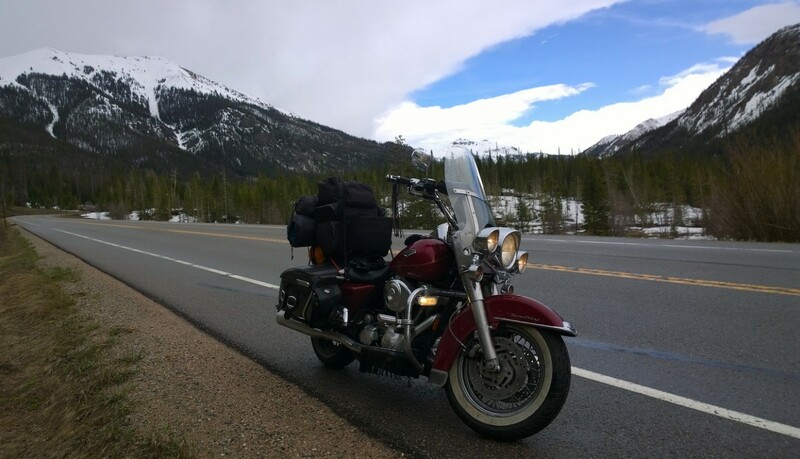 It’s been a tough month, riding the 90-mile round trip to work, on Big Red, my 2004 Harley Road King Classic. The bike wasn’t the problem though, it was me. If you’ve read some of my stories from the last few years you’ll know that I’m one biker who makes a lot of mistakes. It’s not unique to my motorcycling either because I make a lot of mistakes in pretty much every area of my life. At least I’m consistent. So, it came as no real surprise to me when I left my lights on and had to get a couple of guys to push me, which didn’t work and then I had to get a car to jump me off. I ran out of gas two times, and yes, Big Red does have a warning light, and I was watching it, but she died on me. Each time though I managed to shake the bike left and right enough to get some gas flowing so I could ride and then coast into the gas stations. Running out of gas on the Trans-Canada Highway last summer should have taught me a lesson, but I’m a slow learner. I also forgot to bring my rain trousers and so I got soaked a few times. I’ve decided to just call it all” “Practicing for my Trip”. The only thing I haven’t practiced is getting lost, but then I don’t really need any practice with that. I’m an expert. This year I’m heading to California for my daughter’s graduation from university. When I leave California, I’m going to leave my next destinations up to Divine Providence, which has at least one thing going for it: you can’t get lost if you don’t know where you’re heading. I’ve gotten the bike all spruced up in preparation. She’s just shy of having 92,000 miles on her so she needs tender loving care. I got all the oils in the bike changed, two brand spanking new whitewalls and I replaced my windscreen, so she’s ready to go. And hula girl is properly installed. Doesn’t she look good for a 13 year old bike! I’ve been practicing too. I’ve been eating granola bars and beef sticks and dining at some sketchy restaurants. I also bought a new Saddlemen S3500 Deluxe sissy bar bag to hold all my belongings and a Nikon Coolpix P900 camera so I can get good photos of the graduation and the trip. To top it off I bought 10 nice Acid Kuba Kuba cigars to put in my travel humidor for the trip. I like to smoke a good cigar when I’ve achieved something or when Big Red’s broken down and I need to Zen out and think. This year, after California, I don’t know where I’ll end up. When you abandon yourself to Divine Providence and Fate you can’t pick and choose your destinations. So, stay tuned.